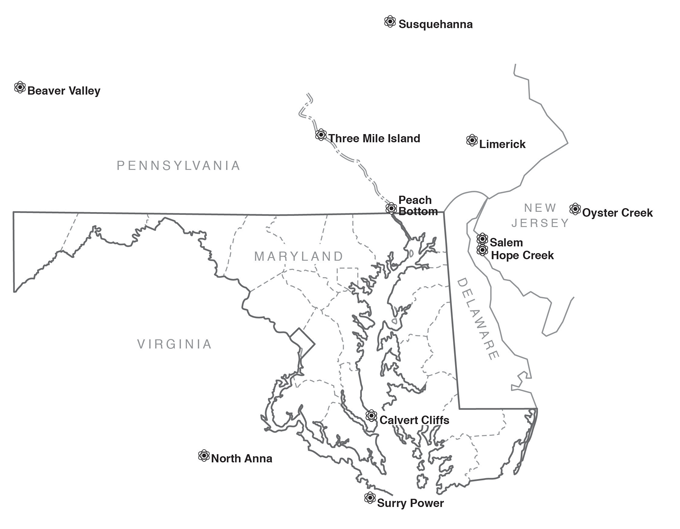 Figure 4-33 shows the locations of nuclear power plants in and near Maryland. Calvert Cliffs Nuclear Power Plant, in Calvert County, is the only nuclear power plant in the state of Maryland. The next closest plant, Peach Bottom Atomic Power Station, is on the Susquehanna River just north of the Pennsylvania/Maryland border. Both of these facilities release very low levels of radionuclides into Maryland’s environment. Exelon Generation Company, a subsidiary of Exelon Corporation, operates the Calvert Cliffs facility on the western shoreline of the Chesapeake Bay. Each of the two units are pressurized water reactors with a total generating capacity of approximately 830 MW. The units began service in May 1975 and April 1977. Exelon also operates Peach Bottom Atomic Power Station (PBAPS). PBAPS began operations in 1974 and is located on Conowingo Reservoir, 2.7 miles north of the Pennsylvania/Maryland border. The plant’s two operating units are boiling water reactors, each with a generating capacity of approximately 1,100 MW. Besides these plants, there are nine additional nuclear generating sites within 100 miles of Maryland (see Table 4-6).